Although it takes just 45 minutes to drive from one end of Rhode Island to the other, the smallest State offers more than 640km (400 miles) of coastline, broad sandy beaches, parks, cities and a wealth of historic attractions. It was also the first State to declare independence from Great Britain on May 4, 1776 and the first that passed laws against slavery in 1774. The revitalization project of Providence, our Capital city, included the rerouting of two rivers and the building of beautifully landscaped pedestrian walkways and Venetian-style footbridges. At the hub of the project is Waterplace Park, a 1.6 hectare (4 acre) urban park that surrounds a tidal basin. The Museum of Natural History and Planetarium is one of a kind in the State, with collections containing over 24,000 archaeological and ethnographic specimens, with the focus on Native American and Pacific Island heritage. Other highlights include the RISD Museum, an art museum which houses 80,000 works of art and boasts an interesting Japanese collection; while in the adjacent city of Pawtucket, the Slater Mill Historic Site, the birthplace of the American Industrial Revolution, is also open for tours. Newport, a top sailing spot, is an all-seasons resort offering a beautiful harbor that is rich in colonial history, as well as white beaches and some splendid scenery. Newport was the setting for the marriage of John F Kennedy to Jacqueline Bouvier and hosted the Americas Cup race for 53 years. 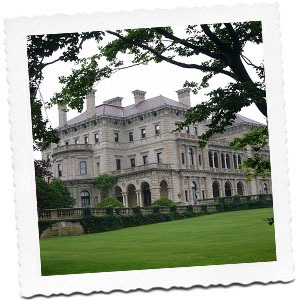 Many of its magnificent mansions (including those built by the Vanderbilts and the Astors) are open to the public. Other sights include the Touro Synagogue, which has been restored to its former glory, and the White Horse Tavern, built in 1673 by a pirate. A summer season of jazz and folk festivals is a major part of its appeal: classical music takes center stage in July during the Newport Music Festival, while the following month sees the arrival of the Apple & Eve Newport Folk Festival. Also in August, the JVC Jazz Festival in Newport, one of the oldest and best known in the country, draws music-lovers to Fort Adams State Park. A popular excursion is the one-hour ferry trip from Point Judith to Block Island to see the National Wildlife Refuge and the magnificent 60m- (200ft-) high Mohegan Bluffs. The State’s scenic centerpiece, Narragansett Bay, is home to yachting regattas as well as a thriving fishing industry. There are (25) listings per page and (20) pages to view. The following Attractions are listed in order by establishment name. Click on the establishment name for additional details and contact information. 18th century historic home authentically restored farmhouse. Offering a variety of seasonal dinners throughout the year as well as gourmet cooking workshops and special events planning. A rambling farm featuring an outdoor zoo complete with exotic animals from around the globe. Featuring corralled llamas, Sicilian donkeys, fainting goats, a zebu, Indian runner ducks, emus, our immense Scottish Highland steer called Mr. McDuff, and our newest edition Nyla the camel. Shooting and game preserve offers English Sporting Clays and upland game hunts. 900 acre farm. Fly0fishing, dog training, Lessons available in shotgun shooting and fly-fishing. Hunting and fishing trips to England and Canada. Gourmet game dinners. Corporate and family outings. Unique miniature golf course with waterfalls, caves, streams and an island. Hardball and softball batting cages. State of the art go-kart track. Bumper boats with water guns. European and American paintings. Manansky sword collection. 14,000 acre management/recreation area in the Southwestern part of Rhode Island. Sports include fishing, hunting, hiking, mountain biking, swimming, horseback riding and motorcycling. Gourmet dining workshops in a historic 1730 home. The museum is considered to have one of the most outstanding collections of foreign and domestic militaria to be seen in the United States. Started in 1960, it has grown from a minute collection that today represents over one hundred countries throughout the known world. The command, Rhode Island Militia, chartered in 1741, is the nation's oldest military organization in continuous service under its charter. This Victorian Living History Museum re-creates the vivid past of Newport in the year 1891. Interact with history as you step back in time for a 45-minute guided tour given by professional actors in costume replicating Newport high society. Call for dates for The Beechwood Speakeasy, Murder Begets Murder, an interactive Murder Mystery and Victorian Christmas Events. Astors' Beechwood Mansion is also available for special events and weddings. Handicapped access on first floor only. Family beach, amusements, kiddy rides, full service seafood restaurants, snack bars, carousel, batting cages, bumper boats, go-karts, miniature golf, game room, ocean view cocktail lounge. The Audubon Environmental Education Center is a unique natural history museum and aquarium that puts fun and excitement into experiencing nature. Interactive environmental exhibits allow you to look inside a 33-foot life-size model of a Right Whale, observe marine life in a tide-pool tank, explore a cornfield at night, and view other fascinating nature exhibits. Walking trails lead from the Center across the 28-acre McIntosh Wildlife Refuge along a 1/4 mile boardwalk, which crosses the East Bay Bike path to Narragansett Bay. Early Georgian-style home of Dr. Joshua Babcock, Westerly's first physician, postmaster and friend of Benjamin Franklin, who was a frequent visitor. Later owned by Orlando Smith, who in 1846 discovered granite on the property which later became one of the country's leading granite centers. A full-scale outdoor ice rink located in the center of renaissance Providence. Twice the size of Rockefeller Center in New York City, the 14,000 square-foot rink is a year round facility. The rink hosts numerous family events and is also available for rental. Birthday and tent parties are also available during the skating season. Ice skate rentals are available. Russell Warren, architect. Replaces earlier structure, burned in 1778, during a British-Hessian raid. Tower bell recast from original Paul Revere. Rhode Island College, now Brown University, was established in the earlier Baptist Meeting House, 1764. Barrington Town Hall (1887-1888) was designed by Stone, Carpenter & Wilson, architects of Providence. The medieval style 1 1/2 story building, constructed with three flank gable units of varying height, has two circular towers. The basement, first and second stories of the towers are constructed of boulders. The historic district also includes the library which is located in the early 20th century school, 18th century cemetery and pond. Four acres of beachfront overlooking Narragansett Bay. Lifeguards on duty from June to September. Parking available to residents only with season parking passes sold at gatehouse. On facade of building at 75 Main Street. Foss, father of Woonsocket journalism, served as trustee of Woonsocket Public Library, 275 Clinton Street, where his portrait now hangs. A superior example of Rhode Island commercial architecture. A brick building with Greek-Revival details, it was used by the Fall River Ironworks, the Rumford Chemical Company and the Phillips Lead Company. Renovated in 1977 by the Rhode Island School of Design for reuse by its Department of Architecture. Changing exhibitions and lectures are open to the public throughout the school year. The 1938 hurricane uncovered the original base of the third lighthouse established in America (1749), an interesting example of early Colonial stonework. The present granite tower, just north of the original light, was erected in 1856. 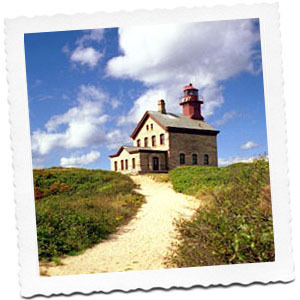 The point also offers spectacular views of Rhode Island's Atlantic coastline. The assistant keepers quarters houses a museum featuring a 4th order fresnel lens, models of many RI lighthouses and a pictorial history of RI lighthouses. Beavertail State Park, located in Jamestown, Rhode Island, is known for offering some of the most beautiful vistas along the New England coastline. The Park attracts people from all over the country, to enjoy it's pristine environment. Beavertail’s most popular activity is sightseeing, and can be done from the comfort of a vehicle, in one of the four overlooks or on foot, from the rocky coastline. Beavertail also provides some of the best saltwater fishing in the area, along with offering hiking trails, and a naturalist program that attracts hundreds of people each year.